A native of Fullerton, California, Coleman grew up the 1950s just a short drive from Los Angeles, idolizing the sports heroes of that era such as Sandy Koufax. Friends of his family had season tickets to the new-to-Los Angeles Dodgers, and he was there for their season in LA in 1958 and their first World Series win over the White Sox a year later. He was in the stands for Koufax’s perfect game in ’65 and once caught a foul ball that just seconds earlier left the hands of the Hall of Fame pitcher. Coleman still has the ball, now autographed by Koufax, a perfect metaphor for his hobby turned profession. 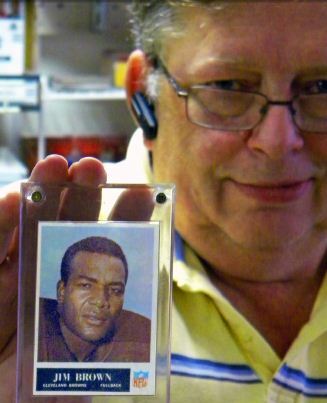 Collector Doug Coleman and his Topps Jim Brown trading card. In the late 1980s, Coleman, his wife Joyce, and their three children moved to Denison when he became the plant manager at Kwik Set, the lock manufacturing plant north of town. Two short years later, Black and Decker bought the company and a things changed. Coleman had been collecting sports cards and memorabilia all his life and so he decided to go into business for himself. Box Seat Sportscards opened in the 400 block of Main Street in Denison in early 1993, adding comic books to his inventory along with the sports cards, signed jerseys, and autographed baseballs. In the late 80s, the card collecting hobby industry saw the market explode with product, and people were getting rich quickly. “The baby boomers were looking to things from their past. Reagan was in office and the economy was going pretty good. People had disposable income,” Coleman said. The baseball and football cards that made it through the boomer generation’s childhood relatively unscathed began to fetch quite a premium. The renewed interest brought out new products and all generations were clamoring for a piece of this burgeoning market. “Whatever the boomers were into when they were kids, they were back into it, collecting it it. “If you had G.I. Joes when you were a kid, you wanted all the new stuff. If you collected cards, coins, Barbies, action figures, whatever. The market boomed, and the manufacturers took advantage of that,” he said. The sports card companies looked for every collector they could wrangle, trying out new ideas left and right. The Upper Deck company stirred up a controversy by acquiring a Babe Ruth game-used bat, then having it sawed up into little bits to put on their cards. Purists were upset. Collectors took notice, and a whole other subset spawned in the hobby. There was now double the supply. But like a pop fly, what goes up eventually comes down. True collectors couldn’t keep up with the market saturation. A recession in the mid-1990s saw a downturn in disposable income, and by 2003, the hobby industry bottomed out. By having a little bit of everything in the hobby, Coleman managed to stay ahead of the steep decline. 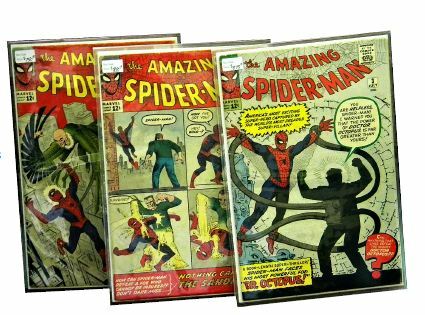 When cards were slow to sell, there were comic book collectors to satisfy. Coleman would hold “pack night” at his downtown shop, letting youngsters buy into the hobby for pennies for packs of cards, all with the hopes new collectors would be found. Today, the sports collectibles market is on the upswing. “It’s not the panic growth we saw before, where it was growing exponentially. It’s a three to six percent growth every year,” Coleman said. Today’s collector has a better definition of what they want to collect. “They have a nice amount of what they like, whether that be a favorite player or team. And they want to get to a point where they can someday get out of it what they got into it,” Coleman said. Those collectors may be looking to pass their collections on to their children. Three of Doug Coleman’s prized comic book collectibles. There’s still a small segment of the collecting industry that speculates; buying up sports cards of promising young ball players in hopes they can buy low and sell high. “But in the end, it’s a hobby, collect what you want and enjoy it,” Coleman said, with a wry smile. Aside from his prized Koufax autographed baseball, Coleman shares tales of the great collectibles he’s acquired over the years. The most valuable? His 1952 Topps Mickey Mantle, the card some consider the Holy Grail of the sports collectible market. 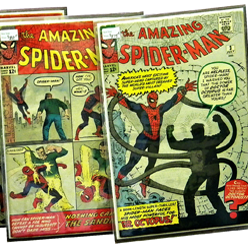 He recently acquired and sold a 1962 Amazing Fantasy #15 comic, which features the first appearance of Spiderman. It’s value? More than $100,000 dollars. But separate from value, the rarest collectible Coleman holds is not a sports item, but a piece of Western lore. He’s waiting for the right time to put up for sale one of only four original saddles that rode atop Silver, and carried Clayton Moore, the original Lone Ranger. Throughout his days, Coleman is crafting more than just a sports collectible business. He’s helping to build up the very Main Street he calls home. Coleman serves on Denison’s Main Street Advisory Board and is a chief organizer of the Eisenhower Veterans Monument, which stands just off Highway 75 at the Loy Lake Road exit, in honor of the former president and commander of armed forces. His eyes light up as he talks about the Eisenhower monument and how much of a draw it will be for those tourists, locals, and veterans who want to honor the president’s memory and show pride in the local connection. Flanked by the mounds of paperwork it takes to bring such a monument to fruition, Coleman said he’s proud to have been a part of this new movement and to continue to be a fixture in downtown Denison. This story was first published in October 2010.